What's the matter? 209 RLT not good enough for ya? You've also given me the best idea for a paint job on a moped if I get one soon. I think you win. If you do it. That's way better than just a license plate. Doug: "Hey I want a carsing saying "Domokun"
Doug: "See this little cute brown cube with the teeth? That's domo-kun!" clerck: " You want a car named after that THING?" Doug: "Shure he is liek my pet and so on you see you know"
Clerck: "Security .. fasssst get this insane person ..."
Best pictorial story of the week! Thank you! You made me smile today! Domo-kun is more vain than I imagined. It was like his birthday or something. Yay! The license plate looks great!!! Well, let's see how it looks after it gets dirty. 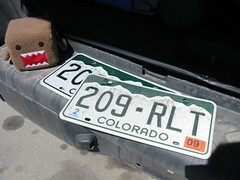 At last, Domo-kun only need driver's license. BTW, are you still human been? Oh! I didn't think about it. Then Domo-kun was drive your car when you sleep.